After moving apartments several times in Jerusalem, I’ve started keeping track of all the questions I ask during each apartment hunt. 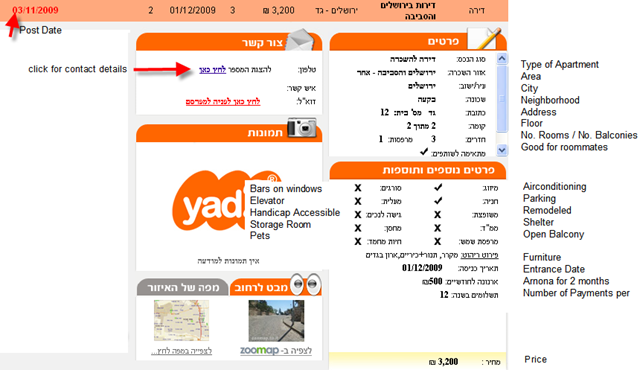 Here’s a helpful guide for how to find an apartment in Israel with lists of different apartment websites. Price: Price range is usually the first thing that narrows down my apartment search. If the price is in dollars, make sure you feel comfortable with the conversion solution which typically is either a)whatever the rate is on the first of each month or b)setting a rate at the beginning of the contract. I prefer the second option so I’m not nervous about what the rate will be each month. Entrance Date: One of the first questions to ask each apartment is if it’s relevant anymore (actuali in Hebrew). And if so, when is the move in date? Location: Will you feel safe walking around at night? Are there lots of busses nearby? Is it near things that are important to you (friends, supermakets, kindergarten, etc.). To help find the street before you head over, you can use Google Maps which takes english or hebrew street names. Number of Rooms: Be wary of the 2.5 rooms – what exactly will that .5 be and will it actually make a difference in adding space to the apartment. Arnona: Depending on the size of the apartment, you’ll have to pay a certain amount of municipal property tax. Floor Number / Elevator: Find out what floor number it’s on – and whether the building is on a raised platform or not. If it’s a high floor, is there an elevator? Shabbat elevator? Vad Bayit: The maintenance fee for each building differs slightly and can range anywhere from 40-300+ shekels per month. The lower range usually covers someone who cleans the building once a week. The higher range usually means that there is heating (hasaka) for the building during certain times of the day. Dud Shemesh(solar panel for hot water): For me, this is really a dealbreaker and I try to only look at apartments that have a dud shemesh. Mainly so I can just say dude a lot, but also because there is so much unbearably hot sun during the summer that it would be such a shame to let it go to waste, and a dud saves electricity costs. Daytime/Nightime: Is there plenty of warm sunshine during the day? Is it scary at night. I recommend checking out an apartment both during the day and at night so you get the full picture. Balcony (mirpeset) / Closed balcony (mirpeset sherut) If an apartment has a balcony, find out if it’s open or closed. Also nice to know if it is sukkah-friendly. Furniture: Does the place come with a stove, fridge, built-in closets, washing machine, couches, etc? Sometimes landlords just happen to have an extra closet laying around. On the other hand, we went to see an apartment that didn’t allow gas stoves so be sure to ask, ask, ask about any details you can think of. Landlords: Does the landlord pace the apartment every 2 seconds? Are they nice on the phone but then shady in person? Pay attention to the landlord’s behavior – you don’t want to be handing your hard earned money over to a scumbag each month. Make sure to ask about repairs, and the landlord’s responsibilities to you. Pets: What I’ve found with pets is that there’s usually a don’t ask, don’t tell policy. The landlords usually don’t care as long as you keep the place clean and it doesn’t cause trouble with the neighbors. Heating/air conditioning: Find out what kind of heating system there is. Also, you can ask the current tenants how the apartment fares during the summer and winter. Roommates: If you’re looking to live with others, you’ll have a whole new list of questions – do you want to live with religious people, people that you know, Israelis, etc. Make sure you get a good, friendly vibe when you’re choosing roommates because you’re gonna see these people plenty. Agent: Check to see if there is an agent. If the apartment is going through an agent, the fee is typically one month’s rent. You can find plenty of apartments without an agent so only use one as the very last resort. Storage: Does the place come with a separate storage space? Good luck with your apartment hunt! If you have anything to add, please feel free to add your thoughts in the comments. I would add neighbors-since I have had to deal with my share of crazy! Ability to sublet the apartment. If you go on vacation, a great way to make some quick cash is to rent it out to others (especially during the holiday or summer seasons). Some landlords let, others don’t. BTW, really nice comprehensive list. Molly, neighbors are such a tricky issues since people are constantly moving in and out. But always worth asking to see what the vibe in the building is. Thanks for adding that to the list. Also, after living here for nearly a year, my landlord just told us we owe him 700 NIS for liability insurance. Also ask about how ofter you have to pay rent (monthly or every three), what the damage deposit is etc. You can be forking over a lot of cash in that first month. Janet, thanks for your input – those are definitely important things to add to the list! What a GREAT post! This is why I created the free apartment/roommate search website for anglo’s in Israel called Diramates (www.diramates.com). Would LOVE to link to this post because it’s so comprehensive – please let me know if that’s okay with you! Thanks Shira, I’m glad you found it helpful. For sure you can link to the post – thank you!!! my wife and i are looking to move to israel. found a beautiful apartment in jerusalem on king david street. one bedroom one bath 2500 sheck a month. he sent pix and its really nice. im thinking it may be too good to be true. hes in london i did speak to him. hes not jewish claims hes from france. you think its a scam? Yehuda, Definitely sounds like a scam!!!!!! Never get an apartment unless you see it!! "19 questions you should ask before renting an apartment in Jerusalem and the rest of Israel" was written November 9th, 2009	by thebigfelafel, and filed under Essentials, Wisdom Gained and tagged apartment, arnona, Israel, jerusalem, Posts by Rebecca, tips, vaad bayit.